According to the American Brain Tumor Association (ABTA), brain tumors are the most common pediatric malignancies and the primary cause of cancer fatalities in children. Approximately 80,000 new cases of brain tumors are detected annually among adults. Over one-third of them are malignant with 17,000 deaths per year. This cell line was thought to be established in 1987 from a female 24YO astrocytoma patient until further analysis revealed the presence of a Y chromosome. SF-268 is identified as being highly anaplastic, or lacking in distinct mature morphology, highly proliferative and likely aggressive. Many preclinical studies are carried out by using in vitro cellular models such as cancer cell lines that have proven to be essential model systems for exploring the fundamental properties of brain tumors. The SF-268 cell line (human brain; glioblastoma / astrocytoma) is used to create the CDX (Cell Line Derived Xenograft) SF-268 xenograft mouse model. 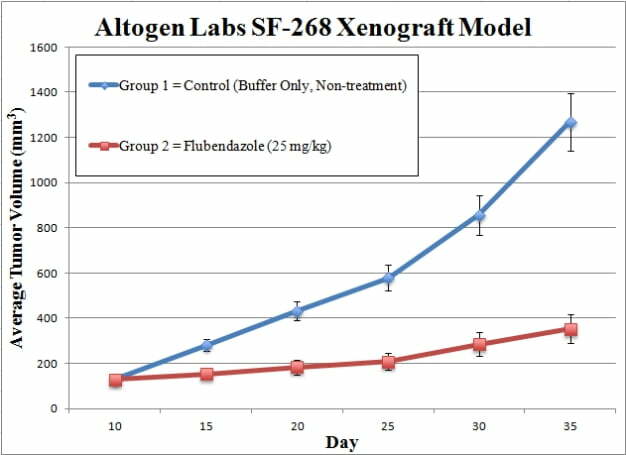 The SF-268 xenograft model exhibits overexpression of ID4, leading to enhanced angiogenesis, and is used in pre-clinical therapeutic agents targeting ID4. Among other studies using the SF-268 cell line is the 2018 Nature study by Zhou et al. which reported a novel utilization of the FDA approved drug Flubendazole for glioma treatment; the drug exhibited inhibition of cell proliferation, promotion of apoptosis as well as suppression of tumor growth in xenograft models through a cell cycle and apoptotic signaling mechanism of action. A well-known 1999 study, cited over 2000 times, by Ashkenazi et al. published in The Journal of Clinical Investigation identified Apo2L as a potential anticancer agent that induces apoptosis in tumor, but not normal, cells. They examined cytotoxic effects of Apo2L across a multitude of cell lines and xenografts; SF-268 served as a brain cancer model in this study. Westphal et al. (1985) identified the SF268 cell line to show affinity to epidermal growth factor (EGF). In modern research, SF-268 is known as one of the brain tumor models used in the National Cancer Institute’s NCI-60 panel of cell lines used for standard screening of potential anticancer compounds in their program known as Developmental Therapeutics Program. A 2013 study by Albanese et al. SF-268 cells used for injection are grown at exponential growth phase until collected for injection. Viable cell counts are determined with trypan blue, and cell counts are determined by hemocytometer. Total cell concentration is adjusted such that each mouse (athymic BALB/C or NOD/SCID, 10-12 w.o.) receives a single injection (subcutaneous) in the hind leg. One million SF-268 cells in 50% Matrigel solution used for 100 µL injection volume. All in-study animals are monitored and continuously palpated until tumor establishment is determined. In-life study initiation begins as mice are sorted (randomization) into treatment groups with average tumor sizes of 50-150 mm3. Administrations of all test material compounds are performed in conjunction with the treatment schedule. Tumor growth is monitored by daily measurements, along with whole body mouse weight documentation (3 times weekly). End of study commences when tumor size reaches 2,000 mm3 (or determined size limit per approved IACUC protocol). Necropsies and tissue collections are performed. Tumors are excised and weighed (tumor imaging is available). Tissues are dissected into microtubes (snap frozen or immersed in RNAlater reagent), prepared for histology or nucleic acids isolated (RNA, small RNA, DNA, and/or protein fraction). Animal handling and maintenance at the Altogen Labs facilities are IACUC-regulated and meet GLP requirements. Following acclimation to the vivarium environment, mice are sorted according to body mass. The animals are examined daily for tumor appearance and clinical signs. We provide detailed experimental procedures, health reports and data (all-inclusive report is provided to the client that includes methods, results, discussion and raw data along with statistical analysis). Additional services available include collection of tissue, histology, isolation of total protein or RNA and analysis of gene expression. Our animal facilities have the flexibility to use specialized food or water systems for inducible gene expression systems.